While waiting for my next module (January 2014) at Goldsmiths I thought of enrolling to the Ways into creative writing class at City Lit. So, after a couple of weeks’ keen anticipation I finally found myself contentedly amidst my new creative-writer-student-colleagues. Then suddenly and without any warning shortly after the lesson started a sudden paralysing feeling of terror rushed through me – the result of having been informed that 1. not only should we complete a 10 minute writing exercise, but 2. read it aloud to our new classmates. That was it. Thoughts of shall I stay or shall I go were racing through my head – similarly nerve-racking like Formula One’s Vettel and Alonso racing and competing for victory. Come on girl, I thought, act like an adult. So I stayed put and for the next 30 minutes tried very hard to remember something fairly entertaining. Naturally, during that time I was only half listening to our tutor. Disappointingly the only thing that kept coming to my mind was the image of the severely corroded valve of my ancient boiler. Just a few days earlier that same valve was the culprit of tripping the RCD switch, as water silently dripped into the electric part of the valve. In the end I did produce and present a short piece. However, instead of my desperately intended wish for describing an interesting and fun childhood memory (I sooo wanted to impress my new classmates!) I only just managed to describe my experience of a boiler break down – an inconvenience feared by many with many more probably still recovering from their own traumatic memories of getting a non-working boiler repaired. I remember my first visit to Glasgow. It was in late September 1995. I still have the one week bus pass and when I look at it, it reminds me of my first impressions of the city which I would visit many more times. The air being fresh and crisp compared to the car-polluted smoke in London, for example. The air in Glasgow reminded me of the air in Austria. Yet on a couple of days Glasgow’s air would smell peculiar. I was told that my nose had picked out the scent of malty Whisky coming from some long slim chimneys of the malting house of a Whisky distillery in Glasgow. 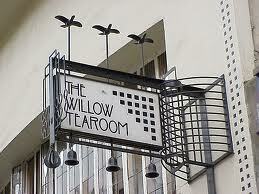 I remember visiting Rennie Macintosh’s tea room, sipping Earl Grey Tea and eating delicious cakes. Glasgow reminded me of Vienna with its beautiful Art Deco buildings and welcoming coffee shops. It felt strangely familiar and comforting sitting in that busy tea room with its cheerful waiters. I remember Pollok Park, a huge country Park within Glasgow and visiting the Burrell collection. Inside this huge park I saw Highland Cows or coos for the first time. I remember feeling sheer joy and excitement watching the beautiful, big eyed fluffy beasts, who were munching graciously the lush green grass of the park’s meadows. After some encouragement they would approach the fence and I could touch their soft long brown hair. Their hair on the head fell lightly over their big brown eyes. I instantly fell in love with them. I liked J’s mum Margaret, a soon-to-be-70-year-old-no-nonsense-woman, who enjoyed sipping Whisky that was mixed with the very sticky brightly orange coloured Scottish national soft drink IRN-BRU, whilst playing cards. I remember the three of us playing either Domino’s, Chinese Patience or Trumps and Margaret uttering Och, I don’t know! ever so often to fill some of the silences. I remember asking J what it was that Margaret didn’t know. I remember that on my first visit Margaret offered me Tea or coffee, hen? She would emphasize that I was a guest and guests were served unlimited cups of tea or coffee. I especially liked the big plastic container, which was the home to any kind of biscuits imaginable and the faithful companion of the freshly brewed afternoon tea served in a medium-sized stainless steel teapot. As soon as the plastic lid was removed a sweet smell of chocolate, toffee and sugar filled the air of Margaret’s sitting room and I enthusiastically accepted her offer to There you go hen, take a biscuit hen. However, within a couple of days I would no longer be a guest but a git. 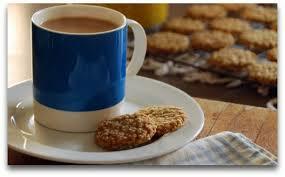 So, to ensure to stay in the good books I had to fulfil my part of duty in putting the kettle on. Once the water had boiled and the … popped I poured the freshly boiled water over 3 teabags, which were carefully placed at the bottom of the stainless steel pot, before placing it on the electric stove where the tea could finally brew. It was important that the tea would not brew too long but just enough. A terrifying task for a novice tea-drinking-Austrian. This entry was posted in My life in London and tagged Austria, Burrell collection, Charles Rennie Mackintosh, City Lit, Creative Writing Class, deutsch in london, Earl Grey Tea, Gerda Brenner, german in london, Glasgow, Glasgow City of, I don't remember writing activity, I remember writing activity, london, Scotland on October 13, 2013 by germaninlondon.